Here is the cake served at Kasma's 20-year celebration party. 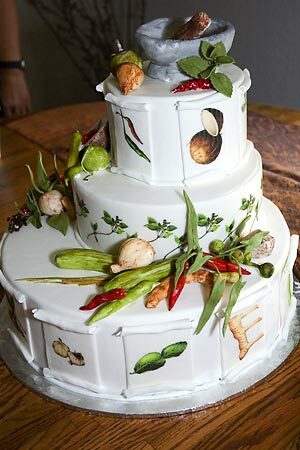 The Thai herbs on the cake are made from fondant and are edible (as is the mortar & pestle on the top). The drawing decorating the outside of the cake reproduce illustrations found in Kasma's first book – It Rains Fishes: Legends, Traditions and the Joys of Thai Cooking. The cake was baked by Julie Durkee of Torino Baking.